There is plenty of movement in the oil world: after five years of relatively stable prices, the legendary "barrel" is coming down from over $ 100 to under 90, and it looks like it will keep falling. What's happening? Has anyone found new resources? 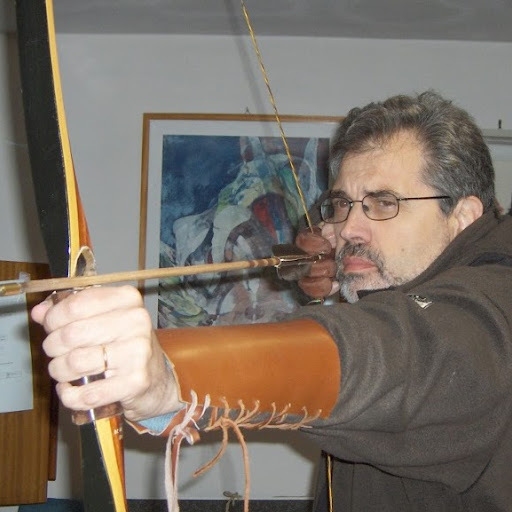 Or is it Saudi Arabia using the "oil weapon" to bring down Russia, the heir of the old "evil empire"? In reality, it is nothing like that. There are no major new discoveries of oil in the world and the Saudi oil weapon is much less fearsome than it is normally described in the media. But, then, why are prices going down? There are good reasons, but we need to understand them and, more importantly, to explain why the likely future drop in oil prices would NOT be a good thing; indeed it could be a planetary disaster. First of all, we should take into account that oil is a finite resource, but also that it is subject to the laws of supply and demand; it cannot escape the control of the entity we call "the market". So, we are seeing two contrasting trends in the oil market. One is the gradual depletion of the so-called "conventional" oil; that is liquid oil extracted at relatively low cost from wells. 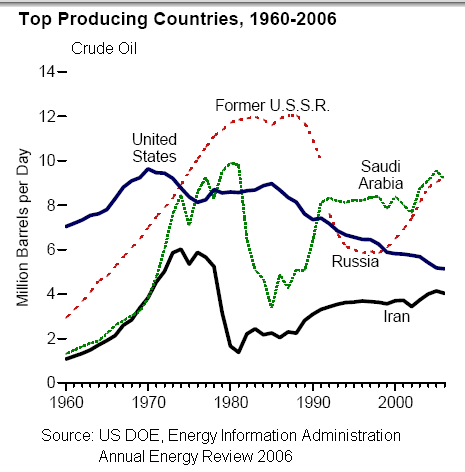 As a consequence, the production of conventional oil is static or declining almost everywhere. The other trend is the increase in the production of "unconventional" oil, that is combustible liquids which are obtained, for example, by treating oil sands, or biofuels, or "oil shale," the kind you obtain by means of the "fracking" process. Up to now, the rapid development of the production of unconventional oil - especially shale oil in the United States - has compensated ​​the worldwide decline in the production of conventional oil; it has, in fact, allowed production to keep growing. At the same time, many of the major economies are in recession and are reducing their energy demand. 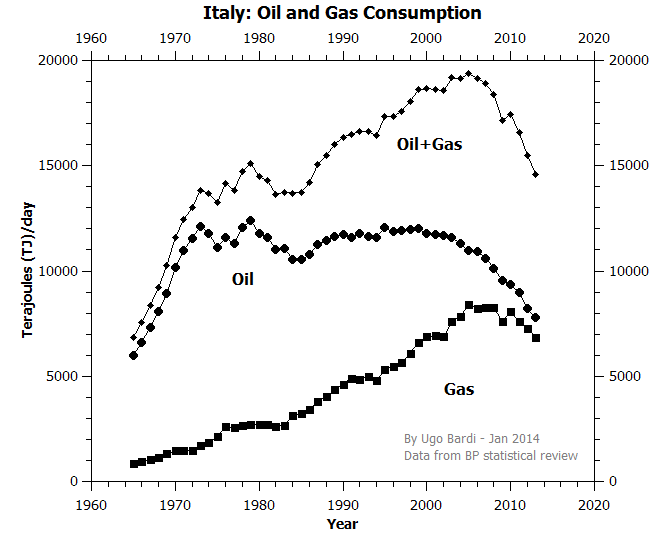 Italy, for example, has lost 25% of its oil consumption over the last five years, and the descent continues. Other economies, such as in Germany, are in trouble, even if not yet in recession. This causes a decrease in the world demand. So, the two factors - increase in supply and decrease in demand - go in the same direction: the market wants the price of oil lowered, and it goes down. We should also take into account that these phenomena are often heavily influenced by the perceptions of financial operators: if everyone thinks that the price of oil should fall, then it will fall. In practice, we risk to see not just a drop in oil prices, but also a true meltdown of the oil market, like that witnessed in 2008-2009. Many people would be tempted to believe that lower oil prices are a good thing, but it is not so. If we will see a repetition of the scenario of 2008-2009, the result can only be a disaster (as it was at that time). The problem is that oil resources are not all the same: to produce certain types of oil is very expensive. Extracting from tar sands or from oil shales, for example, is more expensive than extracting from traditional wells. So what happens if prices go down? It happens that extracting and marketing certain types of oil does not generate a revenue anymore. Then, those types of oil are not produced any more. Who would ever want to produce at a loss? In practice, if prices decrease, the world's oil production decreases: have you ever eard of "peak oil"? It is just this phenomenon: "peaking" does not mean running out of oil; absolutely not. It means that producing more oil is not as convenient as it was before, hence less is produced. Therefore, we see a peak in the production curve. That's peak oil. And that's exactly what may happen in the near future. Oil at over $ 100 a barrel allowed the industry to maintain a fairly constant production - actually even to increase it slightly over the past few years. Oil at significantly lower prices does not allow it anymore, and it forces the industry to reduce production. This leads, among other things, to the closing of many refineries, as is happening in Italy. In the end, it is perfectly possible that oil will cost less in the future, but also that we won't have the money to pay for it. There is nothing to do about that: it is the market, baby! But above all, the troubles come from our attitude that continues to make us believe that oil will last forever. It is not possible. Let's start thinking about that! 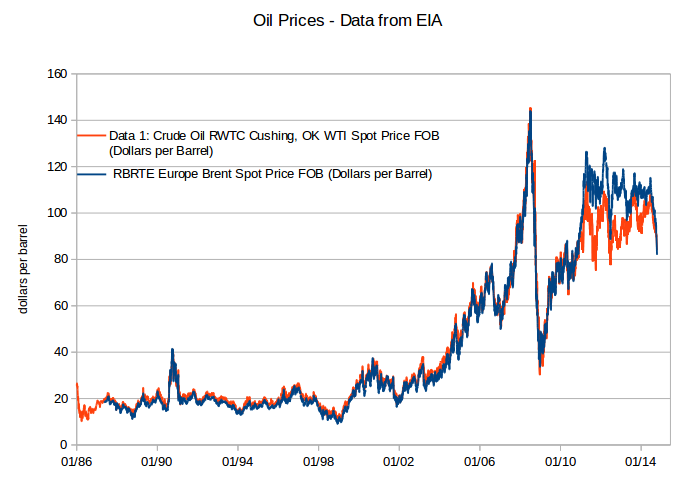 Oil prices: data up to Oct 06 from EIA, updated to Oct 15 according to www.oil-price.net/. Are we going to see a repeat of the 2008 oil price collapse? It is still too early to tell, but, clearly, something is moving in in the oil market: something big; as I discussed in a previous post. If prices really collapse, the consequences could be devastating for the profits of marginal producers, especially for "non conventional" resources such as shale oil, tar sands, heavy oil, deepwater and the like. Unless the dip were to be very short lived (as it was in 2008), it would necessarily result in a fall in the production levels. That would be, of course, a disaster for the world's economy. The oil drama is playing in front of us: we can only watch as it unfolds. 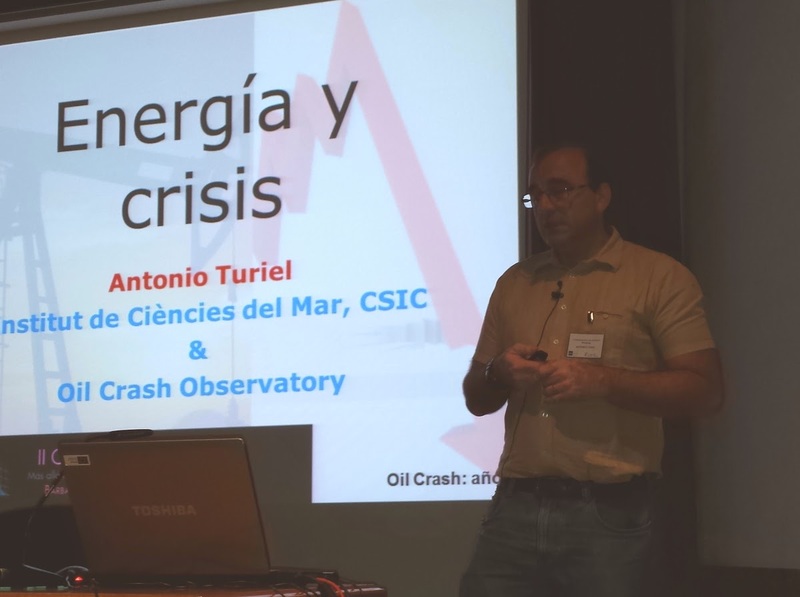 Antonio Turiel, well known for his blog "the oil crash", speaks at the international meeting "Beyond Peak Oil" organized in Barbastro by UNED. It looks like we are staring straight at the peak's ugly face. When I started working on peak oil, around 2001, it was an intellectual game that I played with others interested in the same subject. We listed resources and reserves, we made models, we plotted curves, we extrapolated data, and more of that. But the peak was always in the future. Some models had it in a few years, others in a decade or more. True, it never was a remote future, but it was not the present, either. We knew that the peak would bring a lot of problems, but we couldn't really visualize them. Then, we discovered that oil was not the only resource destined to peak. We discovered that the peaking mechanism is very general and affects everything that can be overexploited. 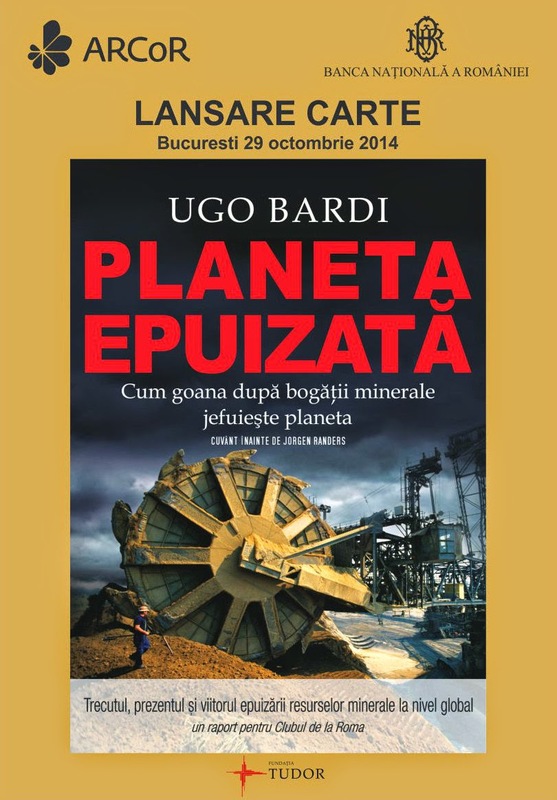 There was peak gas, peak coil, peak uranium and - in time - "peak minerals", which was the origin of my book "Extracted". 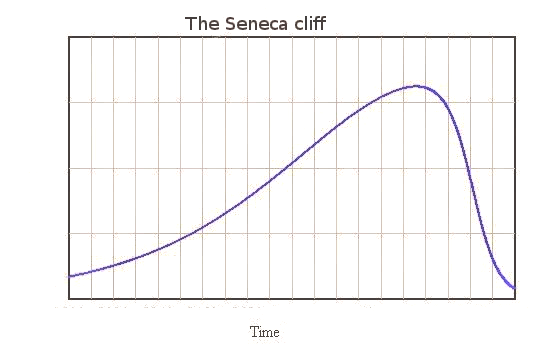 Somehow, peak oil receded to just one of the many peaks expected in the future; still important, but not really so fundamental as we had thought at the beginning. 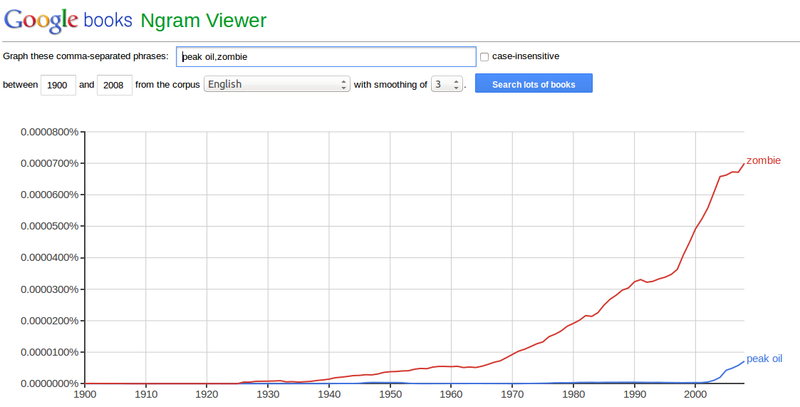 I never lost interest in peak oil, but it sort of moved from a central position to the background of my interests. But things change, and change fast. Two days of conference in Barbastro were a hard reminder that oil is still the most important resource in the world. At the conference, a number of impressive speakers lined up to show their data and their models on peak oil. Antonio Turiel, Kjell Aleklett, David Hughes, Gail Tverberg, Michael Hook, Pedro Prieto. From what they said, it is clear that the future it is not any more a question of arguing about resources and reserves, lining up barrels of oil as if they were pieces to be played on a giant chessboard. It is not any more a question of plotting curves and extrapolating data. No: it is more a question of money. 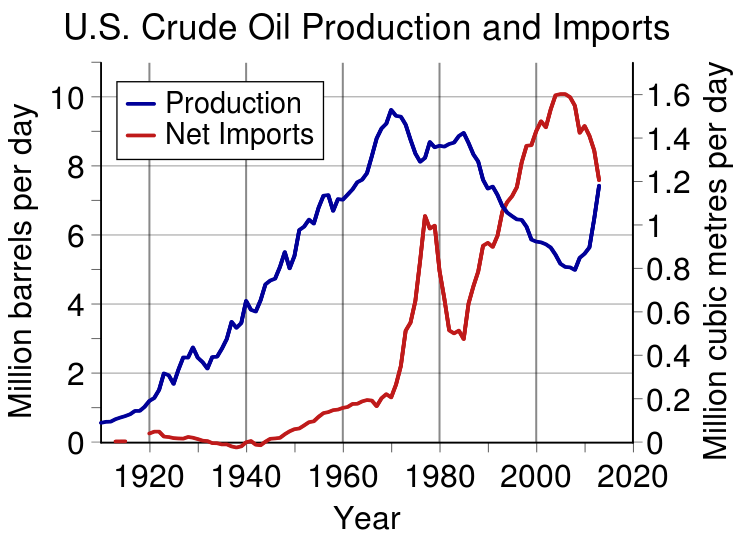 We are not running out of oil, we are running out of the financial resources needed to extract it. During the past years, the oil industry has spent enormous amounts of money to make an immense effort in developing new resources. Up to now, these resources, especially shale oil and shale gas, have done the trick, growing fast enough to compensate for the decline of conventional resources. But this success has been hugely expensive and it can only be short lived. As Arthur Berman said, "Production from shale is not a revolution; it’s a retirement party." Now, there is nothing on the horizon that could repeat the small miracle of shale oil and gas, which managed to postpone the peak for a few years. The party may well be over. What gives the game away are the data showing that capital expenditures ("capex") in new projects are falling and that the industry is pulling out of the most expensive projects. It is a no-win game: the more you extract, the more you need money to keep extracting. But the more money you need, the lower are your profits. And when the mighty financial market realizes that profits are falling, then it is the end of the game: no money, no oil. 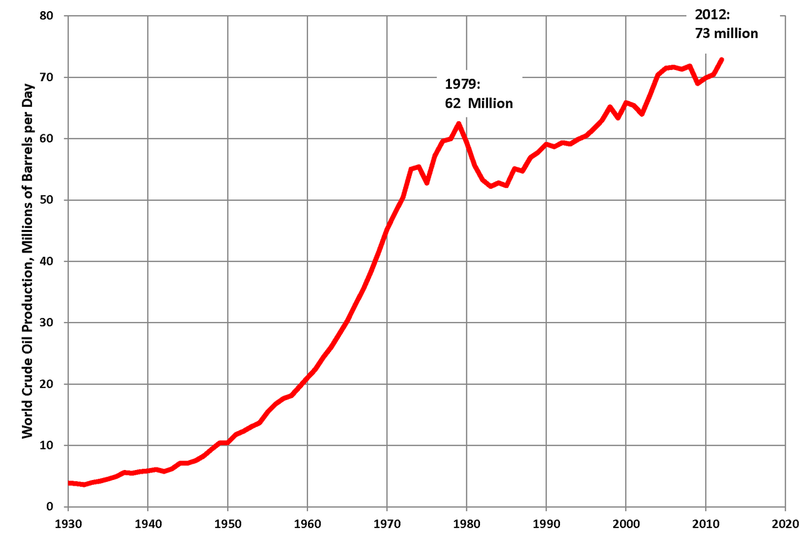 So, peak oil is here, in front of us. It may be this year or next year; or maybe even a little later. But it is not any more an abstract intellectual game: it is directly affecting our life. Look at the world around us: don't you think that there is something deeply wrong with the very fabric of what we call, sometimes, "civilization"? That something could very well be peak oil. We started working on peak oil thinking that if we could have alerted the world of the danger ahead, something would have been done to solve the problem. We didn't succeed: something has been done, but too little and too late. Now we are going through the peak and looking at the other side. What we are seeing is not pretty; we can just hope that it won't be even worse than it seems to be. The Pythoness of the Oracle of Delphi told to King Croesus that if he were to attack Persia "a great empire will be destroyed." Croesus did just that, but the great empire which fell was not the Persian one, but his own. Do you remember the old Soviet Union? Dubbed as "The Evil Empire" by Ronald Reagan in 1983, it disappeared in a puff of smoke in 1991, crushed under a mountain of debts. The origins of the financial collapse of the Soviet Union are rather well known: it was related to the fall of the oil prices which, in 1985, went down from the equivalent of more than 100 (today's) dollars per barrel in 1980 to about 30 (today's) dollars and stayed low for more than a decade. The Soviet Union was relying on oil exports for its economy and, in addition, it was burdened with huge military expenses. It just couldn't take a drop of more than a factor of three in its oil revenues. 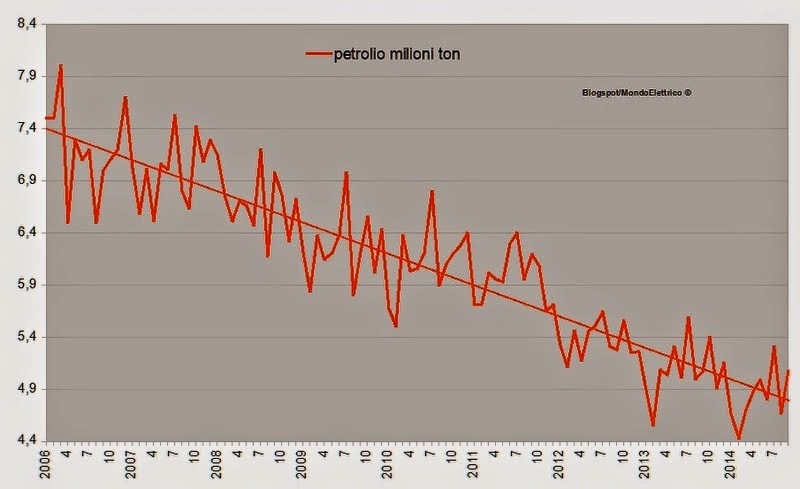 Today, Russia's oil production has recovered from the downfall of Soviet times and the Russian economy is highly dependent on oil exports, much like the old USSR was. So, a drop in oil prices could do a lot of damage to Russia. Given the political situation with the Ukraine crisis, there are speculations that the West is trying to bring down Russia by repeating the same trick that seemed to be so successful in bringing down the old "Evil Empire". Indeed, we are seeing oil prices dropping below $90 per barrel after years of stability around $100. Is it a fluctuation or a trend? Hard to say, but it is being interpreted as the unleashing of the "oil weapon" against Russia on the part of Saudi Arabia. However, the world of today is not the world of the 1980s. One problem is that Saudi Arabia has shown several times to be able to throttle production down, but never to raise it significantly higher than the present levels; one could even question whether they will be able to maintain them in the future. Then, there is nothing today which could play the role that Alaska and the North Sea fields played in the 1980s. It had been said many times that we would need a "new Saudi Arabia" (or more than one) to offset the decline of the world's oil fields, but we never found it. Yet, there are good reasons to think that we could see a drop in oil prices in the near future. One factor is the downturn of several of the world's major economies (e.g. Italy). That could lead to a fall of the demand for oil and, consequently, to lower prices (something similar took place with the financial crisis of 2008). Another factor could be the rapidly growing production unconventional oil (largely in the form of "shale oil") is the U.S. This oil is not being exported in large amounts, but it has reduced the US demand of oil in the world's market. Coupling these two factors, we might well see a considerable drop in oil prices in the near future, although hardly a sustained one. So, would that be the "oil weapon" that will bring Russia to its knees? Maybe, but, as with all weapons, there are side effects to consider. As we said, unconventional oil is playing a major role in maintaining the world's production. The problem is that unconventional oil is often an expensive resource. Then, in the case of shale oil, the decline rate of wells is very fast: the lifetime of a well is of just a few years. So, the shale oil industry needs a continuous influx of new investments to keep producing and it is very sensitive to oil prices. Its recent rise was the result of high prices; low prices might cause its demise. In contrast, conventional oil fields have a lifetime of decades and are relatively immune to short term variations of oil prices. If we see the situation in these terms, we might legitimately ask against whom the oil weapon is aimed. The US unconventional oil industry might well be its first victim. History, as we all know, never repeats itself, but it does rhyme. 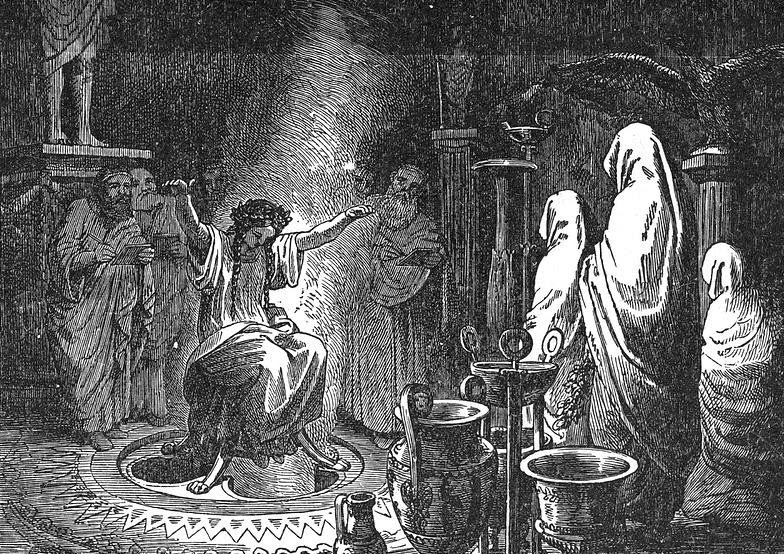 King Croesus, at his times, believed the Delphic Oracle when he was told that he could bring down a great empire if he would attack Persia. He didn't realize that he was going to destroy his own empire. Something similar may be in store for us in the coming years: a drop in oil prices might well bring down a great empire. Which one, however, is all to be seen.